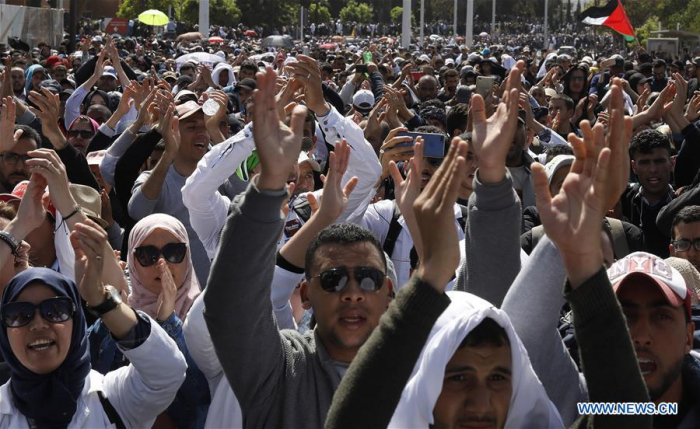 Thousands of people marched on Sunday in the Moroccan capital Rabat to defend free education and show solidarity with protesting teachers, Xinhua reported. Organized by the Moroccan Coalition for the Defense of Public Education, the march criticizes the government's "scheme to terminate all public services." The march, joined by several leaders of leftist opposition parties, denounced a bill under discussion in parliament which calls for the gradual introduction of registration fees in public institutions of higher education and then in high schools. Proposed by the government, the bill faces objection from many opposition parties, trade unions, NGOs and even parliamentarians from the ruling Justice and Development Party. The demonstrators also showed their support to the demands of protesting teachers, including abolishment of regional contracts and full benefits and pensions like public servants. Thousands of teachers, who have been protesting for months, also participated in the march. The teachers, who marched earlier on Saturday in the main streets of the capital, tried to set up makeshift camp for the night ahead of Sunday's march. Notably, the police started using water cannons to disperse the teachers after several warnings. In 2016, the Moroccan government granted the regional educational and training academies the right to hire teachers as part of a larger "regionalization reform." Many trade unions claimed that this move means submission to international lenders, who demanded the cut in the civil service paycheck. So far, 70,000 teachers have been hired under the new contract system, including 15,000 at the training centers.